The launch of the new Springbok jersey took place last night (24 April) at the V&A Waterfront’s Lookout venue in Cape Town. Organisers couldn’t have picked a better evening if they were given the pick of different weather bouquets – with guests enjoying prelaunch drinks overlooking Table Bay with the sun setting over the ocean, people were in awe even before they were shown the real star of the show. 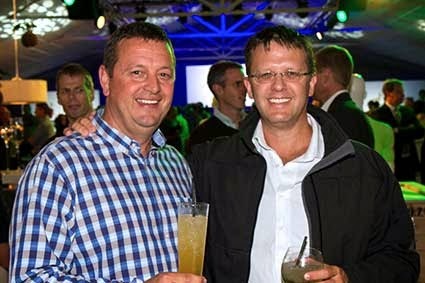 Retailers, distributors and media were keen to see the new Springbok jersey, the design of which Asics had kept very quiet about before the launch despite efforts to lure company members into slipping a detail. “Ever since we’ve announced our sponsorship with Asics last August, excitement has been building towards the big reveal of the new Springbok jersey,” says Jurie Roux, SARU (South African Rugby Union) CEO. Alistair Cameron, CEO Asics Europe. 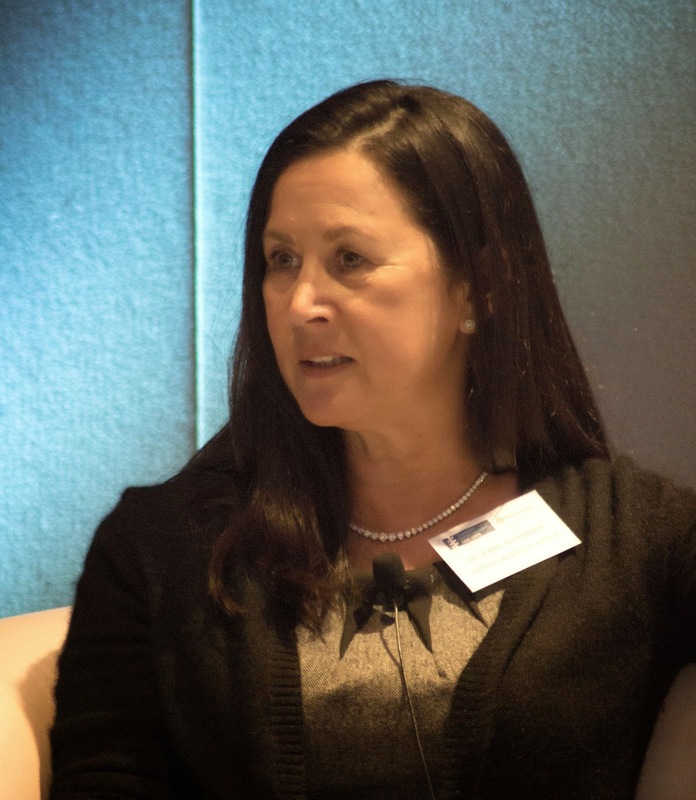 The Japanese brand Asics and the South African Springboks share a similar history of sorts, said Alistair Cameron, CEO Asics Europe. Asics’ founder, Kihachiro Onitsuka, wanted to mobilise the Japanese youth post-World War II and get them active again. He also realised that sport has a unifying quality – something South Africa knows all too well after Madiba wore his Springbok shirt in 1995 and won every South African’s heart. “Through sport, hope can be restored,” said Cameron. Stefan Heinrich, head of emerging markets for Asics Europe, and Brian Pollock of Jordan & Co. When looking for a new technical kit sponsor, SARU had three important boxes for the company to check: they wanted the best technical garment for players, a company that can offer the Springbok brand a global footprint, and (most importantly) the new partner had to be willing to endorse South Africa – our people and our products. Asics ticked all three boxes. They are even already doing research to improve the jersey even more for the 2016 Rugby World Cup. The Springbok brand is globally recognised and desired. “We want to be able to walk in Paris or Timbuktu and buy a Springbok jersey,” says Roux. Asics being a global player takes SARU’s dream of finding the Springbok jersey any place in the world one step closer to reality. 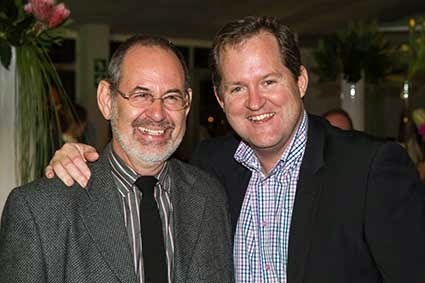 Bradley Moritz (right) and Kobus Potgieter of Sportsmans Warehouse. SARU gave Asics 8 months to get the first replica jersey ready from the drawing board to the hanger – a feat that normally takes around 18 months, says Cameron. Not only has the deadline been met, the brand has managed to have 90% of the replica jersey made in South Africa. 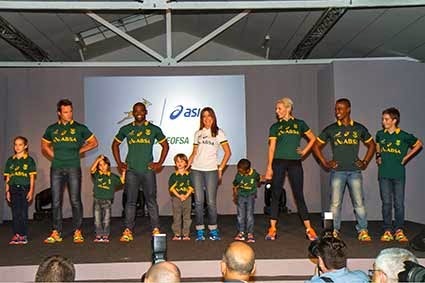 Asics makes use of manufacturers in Durban and Cape Town. SARU is also in the process of signing with Proudly SA. “We will be the first South African federation to be able to say that the bulk of our kit is made in South Africa,” says Roux. Asics doesn’t plan to stop their local manufacturing efforts with the Springbok jersey. They are planning to extend their manufacturing capabilities to include all of their ranges, which include products for tennis, cricket, running, handball, etc. “Our goal is to become the best sporting brand in South Africa,” says Cameron. 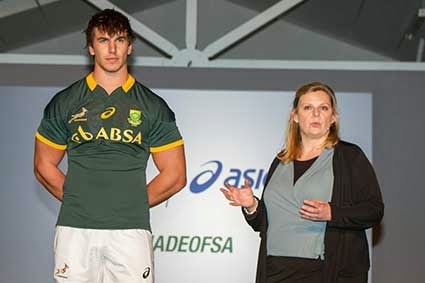 Eben Etzebeth models the new Springbok kit while Yvette Pranger, category manager of rugby for Asics Europe, explains the features. 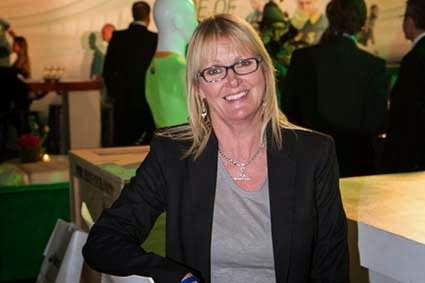 Asics has introduced several improvements to the Springbok jersey, explained Yvette Pranger, category manager of rugby for Asics Europe. It features Asics’ Motion Dry technology, which provides temperature management, makes the jersey breathable, lightweight, quick drying and allows for excellent freedom of movement. Toni Haarburger of Sportsmans Warehouse. The Springbok jersey also features the Gripper technology on the chest, which enables players to keep a better hold of the ball. The same technology is also on the inside of the jersey to stop the shirt from moving around while players are running. Asics created a material that has very good horizontal stretch, but that does not stretch a lot vertically. This is so that opponents have a harder time pulling at the jersey. The bonded seams are reinforced, which makes them less likely to tear. Asics also moved the side seams slightly to the back, which creates less chafing under the arms. Jax Snyman of The Sweat Shop. Even the Springboks’ shorts and socks have been given their own technologies and upgrades. The short is made of strong woven material with a stretchable area on the backside and slippery areas on the sides, to make it more difficult for opponents to hold onto the Springbok player. The socks feature Asics’ Motion Control technology, which provides compression qualities to stop the muscles from getting too tired. Dr Michael Mol, Siv Ngesi, Candice Botha, Liezel van der Westhuizen, Katlego Maboe and young models showed off the new supporter wear. It’s not only the Springboks who will be enjoying technology and improvements in their new jerseys – supporters’ replica jerseys also feature their own set of goodies. The replica jersey – available in home and away for men, women, youth and kids - has a looser fit to accommodate the more traditional rugby supporters’ build, explains Pranger. Like the Springbok jersey, the replica also features the Motion Dry technology, which makes the jersey breathable, lightweight and quick drying. The replica shirt will also be available in a take-down at a lower price point for consumers who want the “look” without the technologies, at a more affordable price. 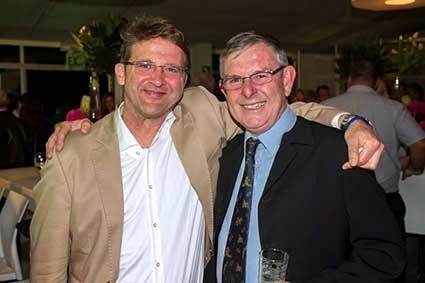 Dirk Wessels of Somerset Sport and Brett Burnill of Leisure Holdings. The Springboks will wear their new jersey for the first time in the game against the World XV on 7 June. “The Springbok jersey is almost sacred to South Africans and I’m very excited about the prospect of running out in this new jersey later this year. Getting an edge over your opponents is important and I’m sure the new technological advances will assist us on the field,” says De Villiers. Dawid Visser, Rykie van der Merwe and Brian Pollock of Jordan & Co. Visser and Van der Merwe will be joining Asics SA. SARU’s contract with Asics runs for six years, and Asics has made a commitment to manufacture at least 70% of its licensed supporter wear in South Africa. 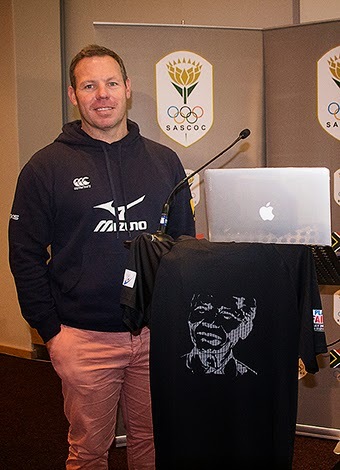 “We believe that it is to everyone’s advantage if we produce the SARU merchandise locally. Our long term aim is that we develop South Africa as an Asics manufacturing center of excellence for all our product ranges,” says Max Keen, brand and sports marketing manager for Asics Europe. 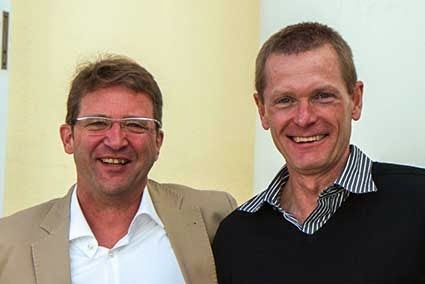 The Asics SA team will be headed by Brian Kerby (right), pictured here with Stefan Heinrich. Asics is in the process of setting up a local subsidiary in South Africa. Read more on our website. 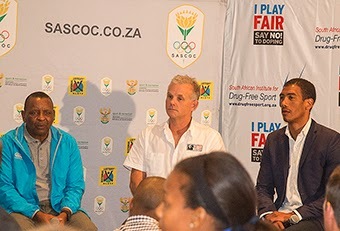 Worldwide Skins chairman Jamie Fuller’s name has become synonymous with anti-doping and “fair play” campaigns – and it was therefore logical for Skins in South Africa, as well as the other running brands distributed by Brand ID, Mizuno and Nathan, to become involved with the “I Play Fair” team of SASCOC president Gideon Sam. 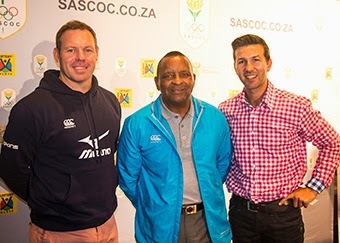 Evert Ferreira (left) and Du Toit Botes (right) of Brand ID with SASCOC president Gideon Sam. 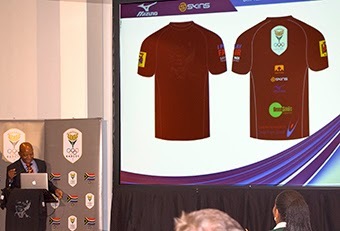 They supplied the Dry Tee shirts and shorts that the “I Play Fair” team ran with in the Old Mutual Two Oceans Marathon – with Madiba’s face on the front and Skins, Mizuno, Nathan, Play Fair, Drug Free Sport and SASCOC branding on the back. Victor Ramathesele, chairman of the SA Institute of Drug-free Sport, emphasised how drugs gave athletes an unfair advantage. Evert Ferreira, who worked with Elana Meyer at the Jag Foundation and ran the London marathon with her before becoming Mizuno and Skins' promotions manager, ran the half marathon with Sam’s I Play Fair team. Evert Ferreira with the race t-shirt displaying Madiba’s face. He recounted how the first South African athlete he caught doping, a boxer, said “But my father said it was OK.” That made him realise how important it was to educate athletes about illegal substances and when they may take medication. Ashwin Willemse told how injured players are targeted by agents wanting to convince them to use drugs that will help them recover sooner – and that he was able to resist the pressure because he knew how he had struggled to recover from a drug addiction as a youngster. Gideon Sam, Dave Bellairs and Ashwin Willemse explained why they believe in “playing fair”. 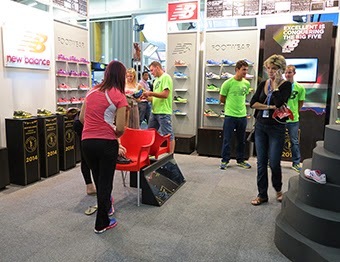 Adidas – official technical sponsor of the Old Mutual Two Oceans Marathon – had an enormous stand at the Two Oceans Expo held from 16-18 April. With demarcated areas for visitors to test their running gait, view their MiCoach fitness app, touch and feel their Boost foam technology, etc. adidas offered visitors a mini show in itself. They had a large variety of clothing, footwear, accessories, etc. for visitors to test and buy at their main stand, as well as from a smaller stand near the exit as visitors were leaving. 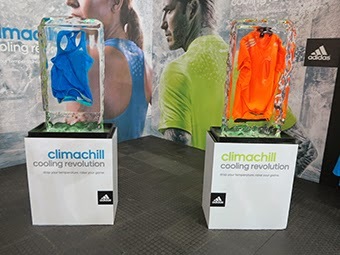 Visitors could touch adidas’ Climachill t-shirts that were on display. The biomechanical men formed part of adidas’ many displays. The displays were eye-catching with biomechanical ‘running men’ store dummies showing off clothing and their Boost running footwear, and Climachill t-shirt ice sculptures where the t-shirts were frozen in the ice. Visitors could touch and feel the garments through a hole. 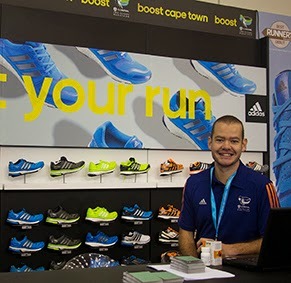 Sport scientist Dr Ross Tucker was on the stand to give advice and also featured on the adidas Two Oceans Marathon running blog where he introduced viewers to the race routes and offered advice on what to do throughout the run. Dr Ross Tucker was on the adidas stand giving visitors advice. 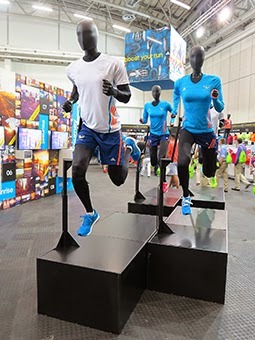 Brand ID’s Mizuno, Skins and Nathan brands were exhibited on a stand that featured biokineticist Sima Lunga. He offered visitors 360o foot scans to help give an idea of shoes that would best fit the runner’s style, and to advise on how to prevent injury that may be caused by a particular running style, as well as how to take care of injury if it has already occurred. Biokineticist Sima Lunga, offered visitors 360o foot scans and advice. New Balance promoted their Fresh Foam 980 shoes as well as their Comrades Marathon shoe. The Fresh Foam 980 had a centre podium where visitors could view the brightly coloured shoe and its unique spray-paint finish, while there were smaller stands along the edges with the Comrades Marathon shoe in the colours of the South African flag. New Balance is the official sponsor of the Comrades, which will be run on June 1 this year. The New Balance stand highlighted their Fresh Foam 980 and Comrades Marathon shoes. Distributors Michelle and Clive Chowles and their Western Cape agent Bradley Player were on the Brooks stand, where they explained the differences between their Float (Core) and Feel (PureGrit) ranges to visitors, which was also the theme of their stand. Distributors Michelle (right) and Clive Chowles (middle) and their Western Cape agent Bradley Player (left) happily explained the difference between their float and feel ranges. 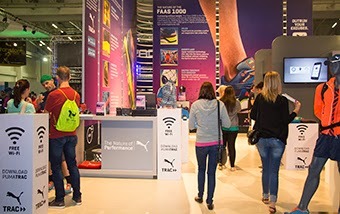 Puma offered visitors free wi-fi to download their Pumatrac app at their stand and had podiatrist Carlo Longano assessing visitors’ gait, which helped them select a shoe suited to their running style. Free Wi-Fi to download the Pumatrac app at the Puma stand attracted visitors. 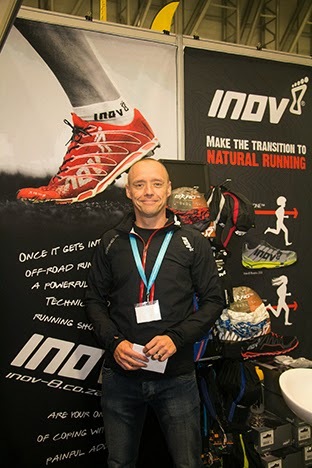 Donovan van Gelder from Rebel Elite Fitness was on the Inov-8 stand, which featured their Trailroc range and triathlon running shoes, as well as other items, such as the Spibelt, which runners find useful for storing items during a run. 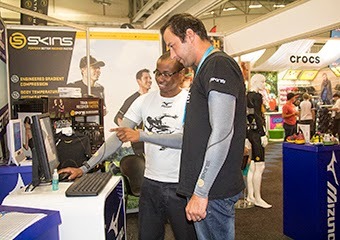 Rebel Elite Fitness’s Donovan van Gelder welcomed visitors at the Innov-8 stand. 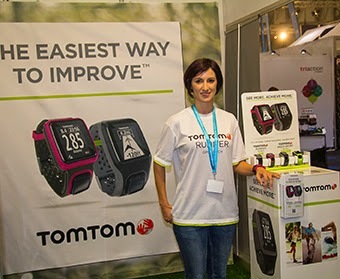 TomTom GPS watches were selling very fast during the expo, said Chantal Grobler, who confirmed that the watches generated phenomenal interest and surpassed expectations on the first day. They were available at the TomTom and Cape Union Mart stands. Chantal Grobler was on the TomTom stand where their watches sold beyond expectation. Salomon had their hydration packs, running shoes, pure trail shoes and water proof jackets on display. One of the products that stood out from their stand is their advanced skin hydration packs. 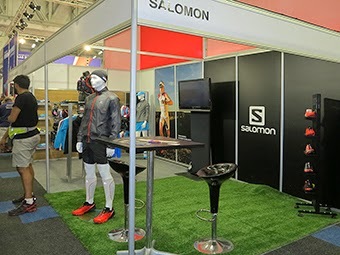 The Salomon stand featured various mannequins dressed in their gear. The Osprey running packs and Buff technical scarves that offer shade on the neck and head as well as moisture management properties, generated plenty of interest on the Adventure Inc. stand, which also featured their many other running-related brands. 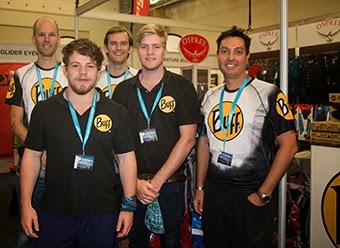 The Adventure Inc. team: (from left to right) Leo Rust, Cameron Vinokur, Chris Kimmerling, Brandon Wheeler and Morne Strydom were at the Adventure Inc. Stand. 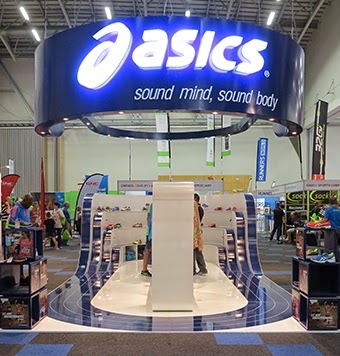 Asics not only introduced their latest running shoe, clothing and accessory ranges on their stand, but also inspired runners visiting the stand with their global marathon campaign. The Asics stand featured their logo lit up above the stand. 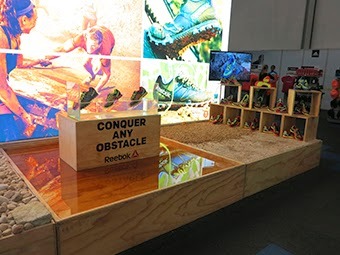 The Reebok stand showed off their shoes’ ability to conquer any obstacle. 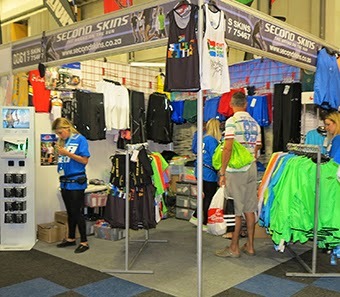 South African clothing brand Second Skins attracted visitors interested in their running clothing, including the “South African branded” t-shirts that offered international runners a unique reminder of their visit and participation in the “world’s most beautiful marathon”. The Second Skins stand was packed with a variety of products. The annual Old Mutual Two Oceans Marathon Expo usually attracts more than 45 000 visitors in the three days before the marathon – figures for this year’s show were not yet available at the time of publication. Labels: Cape Town, Expo, Old Mutual Two Oceans Marathon. Outdoor enthusiasts nowadays want to stay connected to friends, family and their music favourites via phone, laptop or audio player, even when bundu bashing. Athletes want music and coaching information on the run. Solar chargers, wind chargers, power adaptors and wireless bluetooth connections keep tablets, smartphones, radios, GPS’ running all the time, from the Amazon to Zimbabwe. The many ways in which people on the go can stay connected was recently demonstrated at a Wintec Solutions media and dealer conference. Wintec Solutions was founded in 2006 by South African Rene Winter, who qualified as a mechatronic engineer in the mid-2000’s, just when the world started waking up to the possibilities of action audio products. After obtaining an engineering degree from the Athlone Institute of Technology in Ireland (his parents are Irish), he specialised in mechatronic engineering at Napier University in Scotland, before joining SFX Technologies. He developed two patents for audio devices – for example, to convert a cellphone into a speaker by using a table as amplifier - before homesickness brought him back to South Africa. 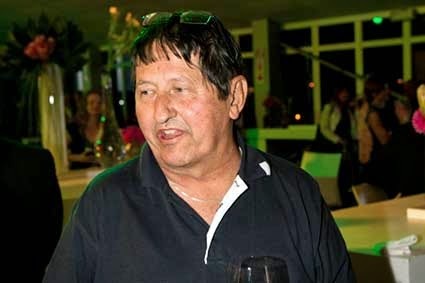 Here, lifestyle electronics was still in its infancy and he therefore decided to ask Jerry Ranger, CEO of Powertraveller, with whom he worked closely in the UK, if he could distribute their products in South Africa. Powertraveller was the first brand Rene Winter imported. Powertraveller has been developing portable power for the past 25 years and have won several awards. They have several portable power management systems - for example, multiple power attachments, a glow-in-the-dark version and the Powermonkey Extreme with the Aquastrap that is so waterproof that it functions even when submerged in a fish tank for up to 30 minutes, to name a few. One power source can charge a desktop computer to give it eight hours extra battery life, another will charge handheld devices for a week. 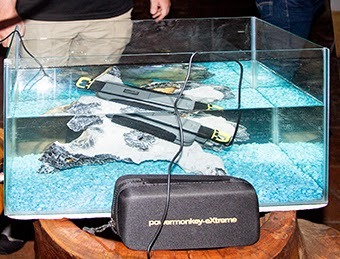 The Powermonkey Extreme works after it was dropped in a fish tank. Some are solar power chargers, others are wound-up. But all are lightweight, compact and portable. 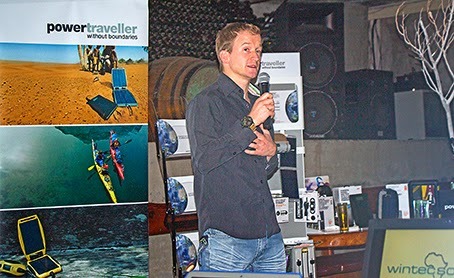 Ray Chaplin, an IT industry-expert turned adventurer, explained how the small Powertraveller solar charger enabled him to tweet, phone and blog during his six month trip along the whole length of the Orange River – from Lesotho to the sea. Along the way, he joined with schools in community clean-up projects along the riverbanks and in order to organise that, he his phone had to be charged every evening. 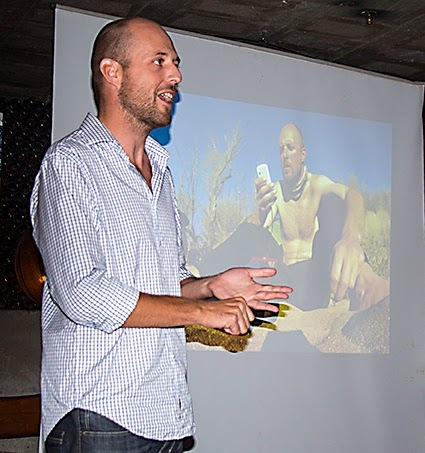 He relied on Powertraveller to charge his phone, GPS and GoPro in 1 ½ hours every evening, he told the audience. Adventurer Ray Chaplin explains how he stayed “connected” during a 6-month riverboarding trip. 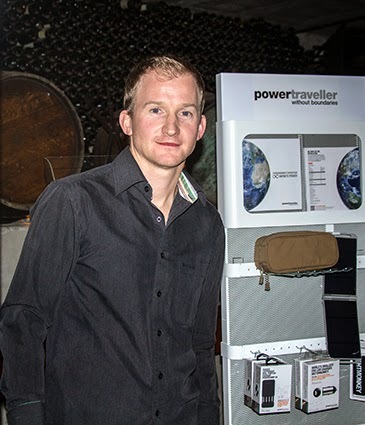 When Powertraveller proved its success, Winter started looking for new portable connection brands in the sports and outdoors industries and found Skross – a portable USB charger with “a whole range of connecting power”, Skech protective and waterproof cases, Jobi (now replaced with Outdoor Tech) and Runtastic. The Runtastic GPS watch with heart rate monitor, bluetooth heart rate monitors, speed sensors and safety armbands work with a range of apps to act as tracking, “coaching” and connecting devices for athletes. 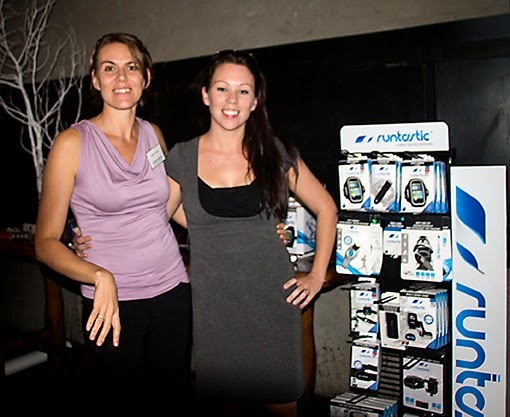 Wintec Solutions marketing manager Janine Forster and general manager Nina Moten with the Runtastic range. A wide range of apps can be downloaded on cellphones. Sports armbands and bike cases are available in the range to keep cellphones in place during a run or workout. Accessories like a headlamp to light the way, a scale that not only measures weight, but also body fat and water percentages, muscle and bone mass, BMI, BMR and calories burned, are among the products that further enhance the training experience. The newest brand they acquired is Outdoor Tech. 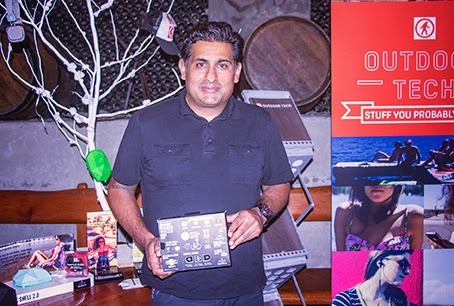 What sets Outdoor Tech apart from other companies supplying lifestyle audio accessories is their cheeky, fun approach, says new international sales director, Bobby Ali. Besides offering reasonable products at reasonable prices that are easy to use, waterproof and shockproof, he adds. This humorous approach was one of the contributions Ali made when he was persuaded to leave his senior position as Territory Manager for Oakley and join the new action lifestyle wireless audio brand. The wireless products offered by Outdoor Tech have been designed with a rubberized finish to withstand rugged handling in the outdoors or when travelling on bikes – with attachments supplied. The “fun” theme is incorporated in interesting designs – like the turtle shell shape of their speakers – and the bright colours of the products. They can all be easily paired with any bluetooth device. 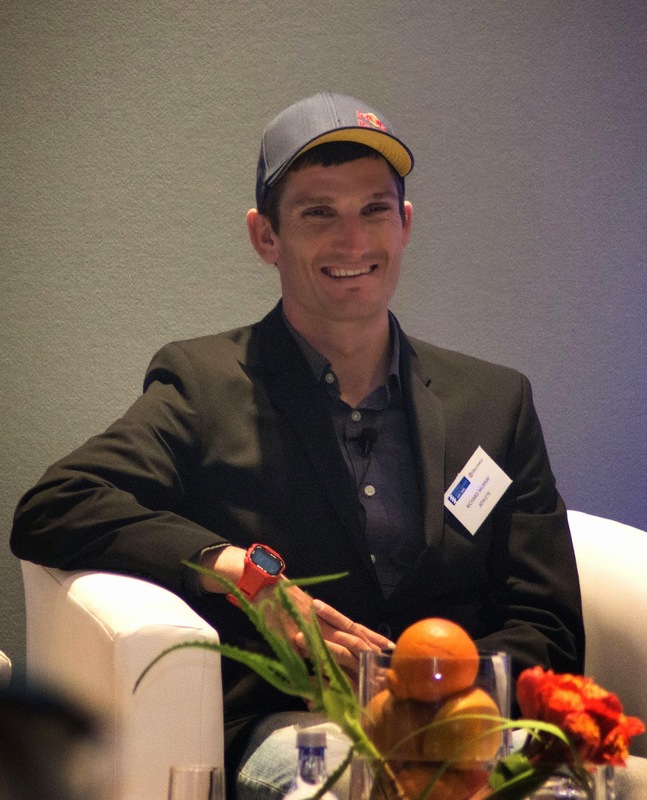 The inaugural Discovery World Triathlon Cape Town event, which takes place 26-27 April, was pre-launched yesterday at the Westin Convention Square. The International Triathlon Union (ITU) late last year announced that Africa is the latest continent to host the event. Chicago is the other city to debut in this year’s ITU series. Other cities to host the World Triathlon Series are Auckland, Yokohama, London, Hamburg, Stockholm and Edmonton. Visitors congregate in the foyer before the discussion. 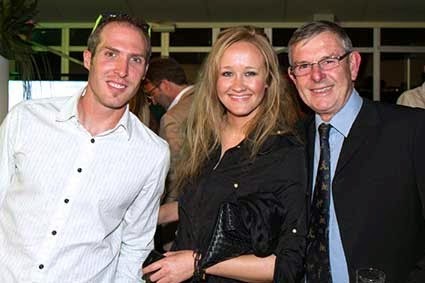 South African Triathlete Richard Murray is looking forward to the race. Over 1 000 participants will be competing in this year’s Cape Town event, including South Africa’s very own Richard Murray (# 5 in the world). Top international triathletes from around the world will also be competing. Organisers are hoping to have 10 000 participants competing in the next 10 years. The panel - (from left to right) Gidon Novick (Discovery Vitality CEO), Debbie Alexander (Triathlon SA President), Richard Murray (SA triathlete) and Iain Banner (an event partner) - answered visitors’ questions. 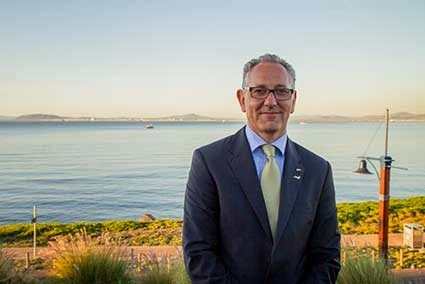 A number of excited stakeholders and visitors attended the pre-event launch, including sponsors, SASCOC president Gideon Sam, Murray, and members of the media. Sam said he is very delighted that South Africa will be hosting an event of this magnitude. He also hopes that the event will leave a development legacy behind for the youth. 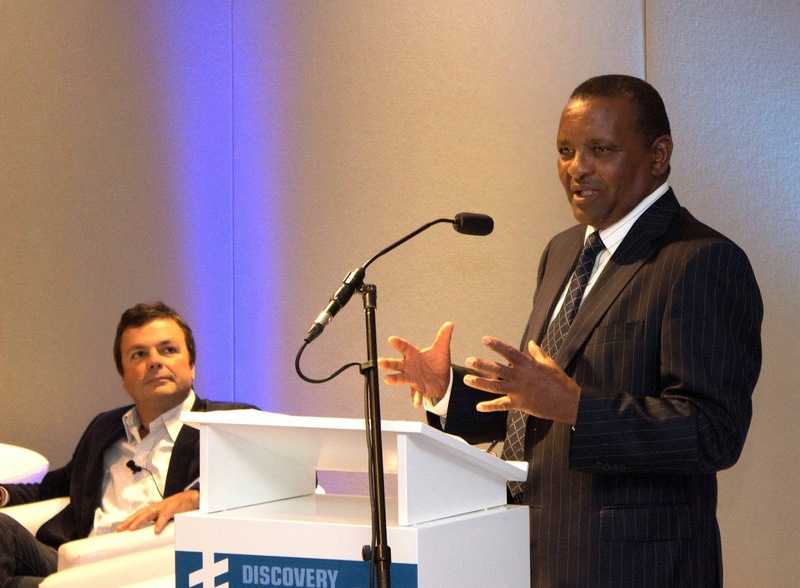 SASCOC president, Gideon Sam, addresses the audience while Iain Banner looks on. Triathlon South Africa President, Debbie Alexander, explains their coaching development plan. Discovery is the official title partner and Virgin Active is the official partner of the event. 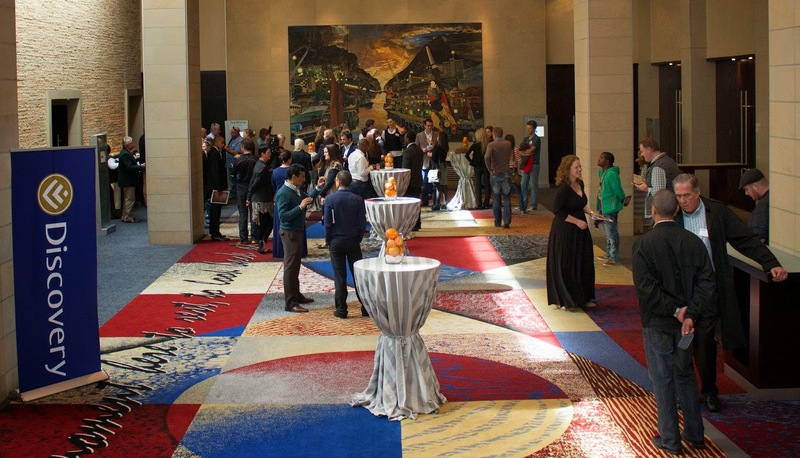 Cape Union Mart and their K-Way brand held a Gear Exhibition on 26 March at the Townhouse Hotel in Cape Town. The show featured brands – which included international as well as their in-house K-Way brands - exclusive to Cape Union Mart. 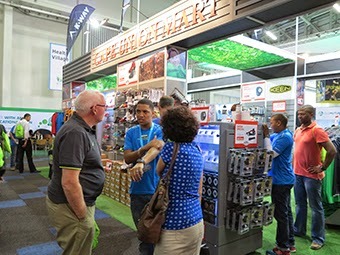 Visitors at the entrance to the K-Way and Cape Union Mart Gear Exhibition. The company presented from backpacks to clothing to sleeping bags, etc. 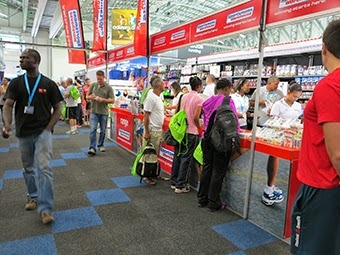 Visitors could view and have a touch and feel experience with products in their collection at various stations, where a well-informed K-Way brand or Cape Union Mart store representative would explain the features and benefits associated with products. 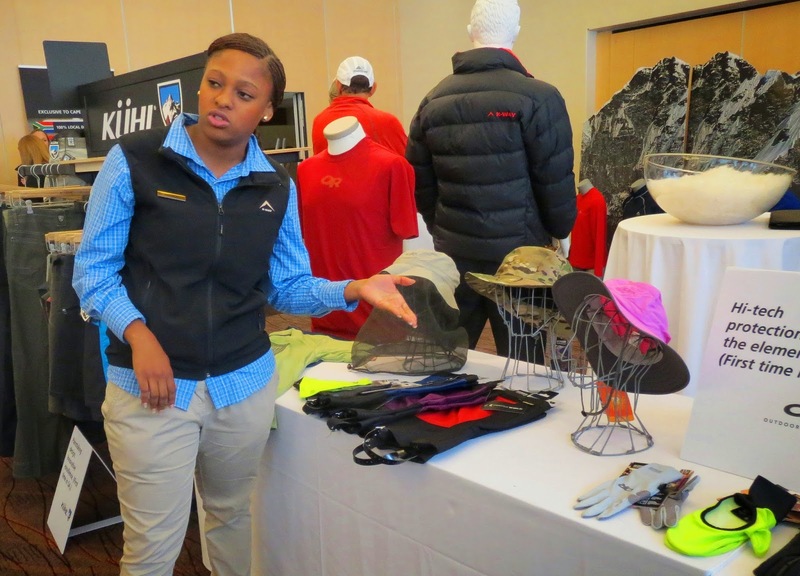 K-Way’s Amanda Centane explaining the benefits of the Outdoor research brand of clothing. 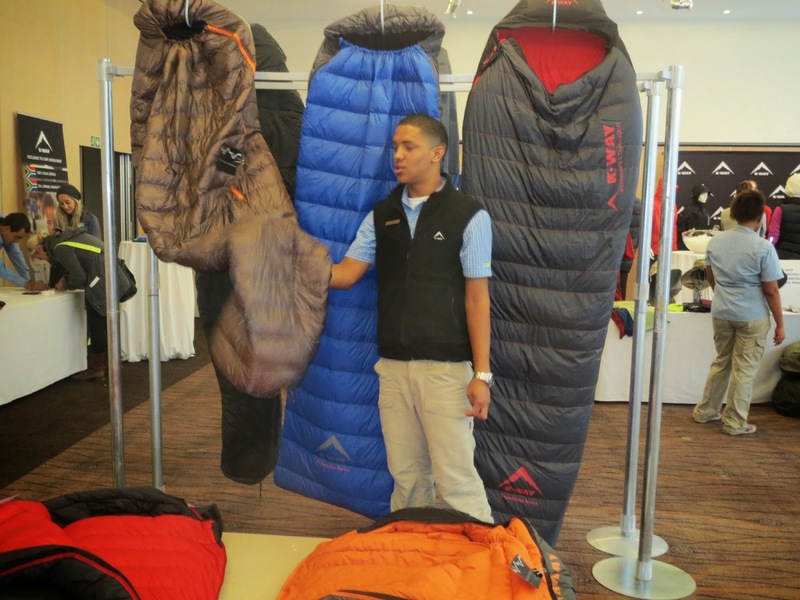 Ziyaad Bailey shows that K-Way sleeping bags are lightweight. 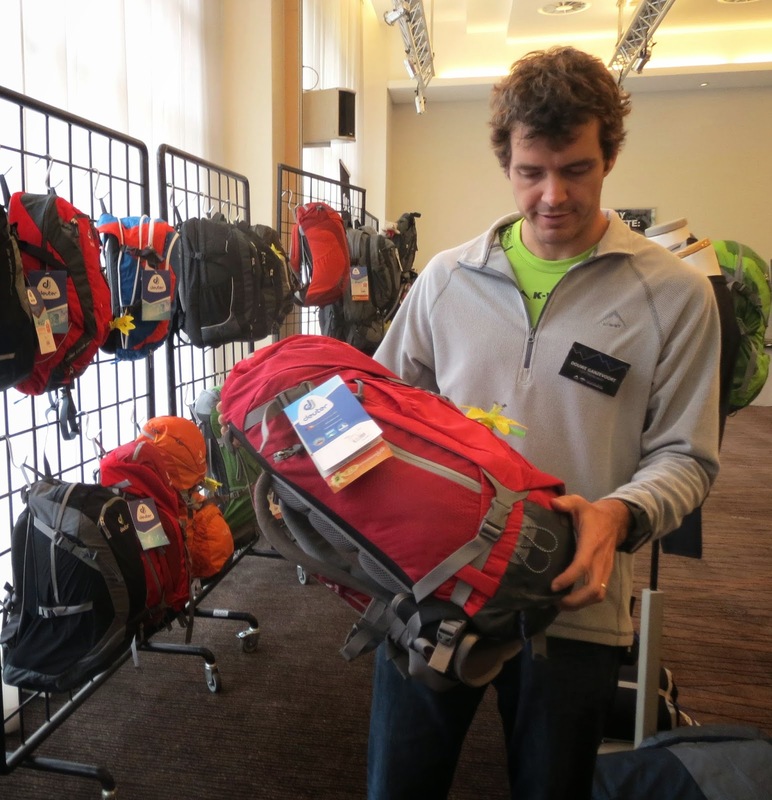 Among the featured international brands were Deuter and Source backpacks, Keen footwear, Kuhl and Outdoor Research clothing, Storm technical wash, etc. The K-Way equipment, on the other hand, is locally designed and majority of the products are locally produced. The items are wear-tested in extreme conditions, such as Kilimanjaro and Everest. Douwe Ganzevoort showing the benefits of the ladies’ backpacks in the Deuter range. 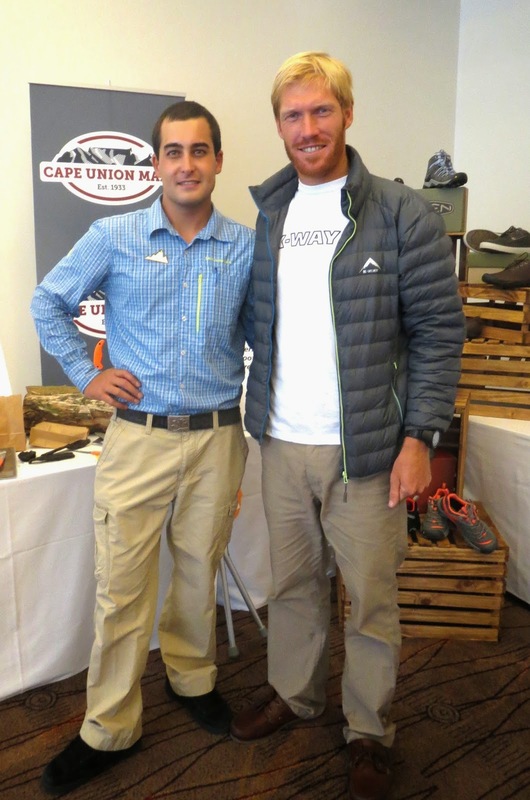 K-Way athlete AJ Calitz (right), with Jaco Bruwer (left) from Cape Union Mart, also came to see what the show had to offer. 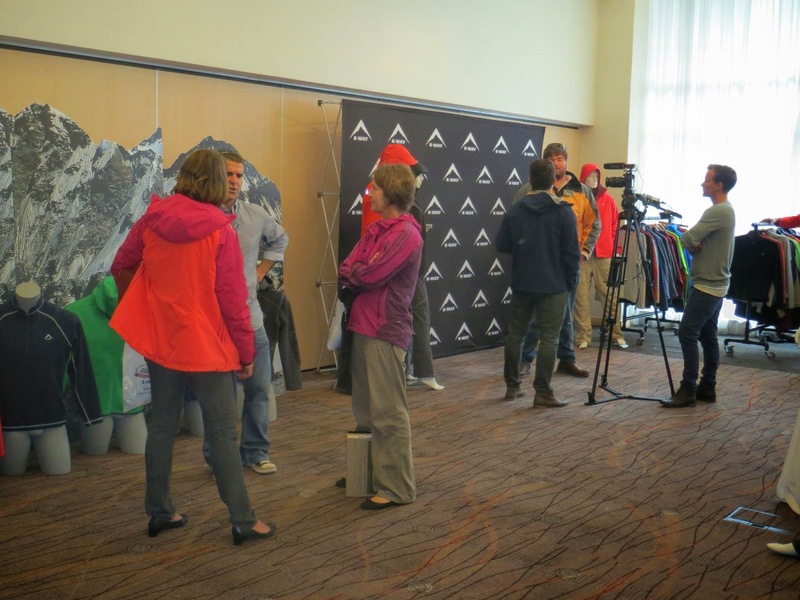 The show also doubled as the hand-over ceremony of the suit K-Way has produced for Ronnie Muhl, who will be summiting Everest. The suit weighs approximately 3.2 kg and has approximately 150 compartments that have been hand-filled with down, says Stevie Hector, from K-Way. 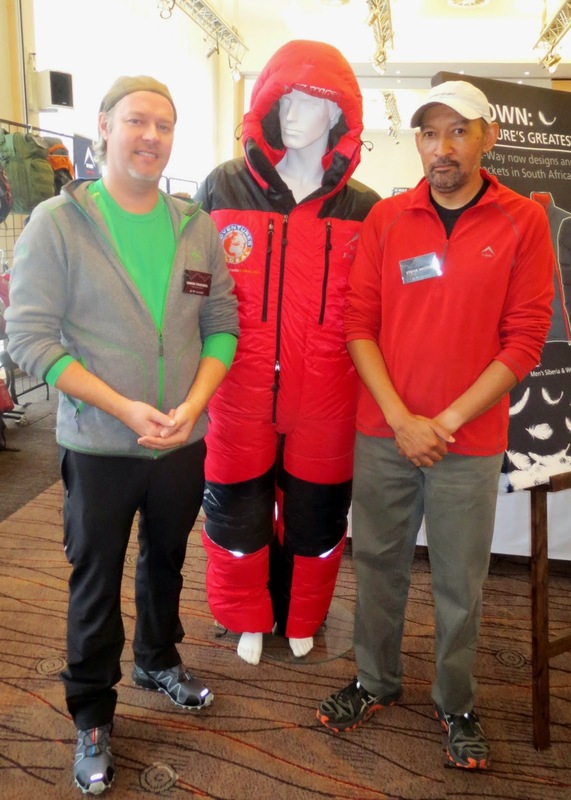 Simon Fraenkel (left) and Stevie Hector (right) show off the suit K-Way produced for Ronnie Muhl’s Everest expedition.